Music has always meant a lot to me. I am, however, not musically talented. As I child I never saw The Sound of Music (or Mary Poppins, for that matter). College finally introduced me to Julie Andrews when friends were aghast at how deprived my childhood had been. Sound of Music was cute, but I didn’t really “get it” until someone explained that it is largely a true story. There really was a Maria von Trapp and Captain. Much of the story, of course, my colleagues (not really knowing) told me was fabricated. My daughter has recently returned from a musical tour of part of southern Europe, centering mostly on Austria. The tour group visited Salzburg and saw where part of The Sound of Music was filmed. 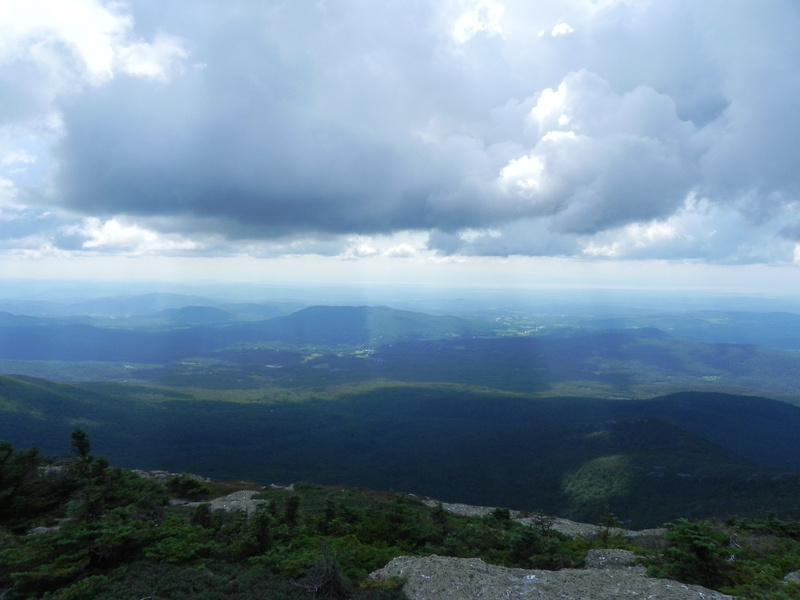 When she returned home we decided to visit Stowe, Vermont. This mountain community, known for its skiing, is where some of the von Trapp family still live. Not sure what to expect, we signed on for a tour of the Trapp Family Lodge (a little beyond the comfort range of someone unemployed until recently). The first surprise came when Sam von Trapp, the grandson of Maria, introduced himself as the tour guide. Many of the mysteries of fact versus fiction were cleared up—I can’t reveal it all here, otherwise you might not visit Stowe for yourself—and the person of Maria von Trapp became much more like the rest of us. During an interview taped four years before she died in 1987, Maria explained how the course of her life was changed by the mountains around Salzburg. Feeling the presence of God there, she joined the convent that sent her to tutor one of Baron von Trapp’s daughters and that eventually led to her marriage and the formation of the Trapp family singers. She was urged on in her marriage, as the movie indicates, by the sisters of the convent. A second surprise emerged as the narrative turned to how the von Trapp family tried to help out others in times of difficulties. Not content to count themselves uniquely blessed by having escaped Austria the day before the Nazis closed the borders of the country, they sent supplies to those who were still under threat of Hitler’s regime after the Anschluss. The home made famous by the movie became Nazi headquarters in Austria. It seems that in this case religion led to a favorable result. Some critics argue that religion brings no good. I have to admit that often I feel as though attempting to justify it at all is a fool’s errand. It is good to be reminded once in a while that lives are sometimes changed for the better by what they believe to be the divine voice. Even in my horror film world, The Sound of Music still has its place. On a weekend trip to Waterbury, Vermont, I found the sweetest cemetery ever. 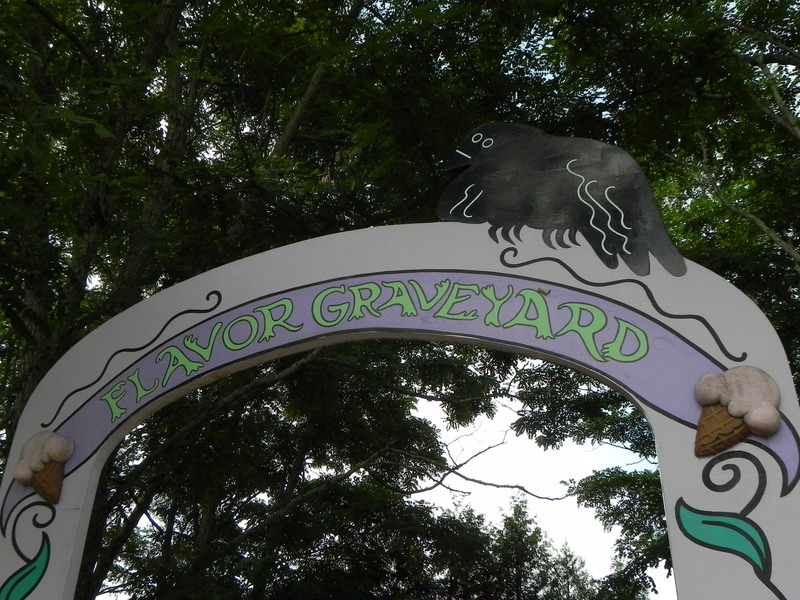 Ben and Jerry’s ice cream factory features a Flavor Graveyard where tombstones to deceased flavors stand. 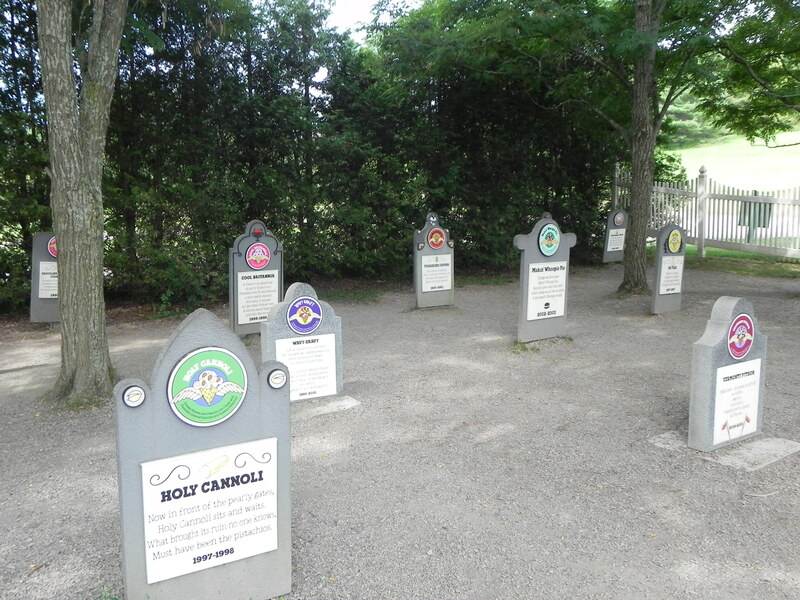 The epitaphs are frequently witty and the experience is lighthearted for kids and adults alike. I wondered, as I stood there looking at the monument to Bovinity Divinity, at the persistence of the belief in an aftertaste—what I presume is a flavor’s version of an afterlife. We like to believe in something more, sometimes at the expense of the here and now. Nevertheless, Ben and Jerry stand for something more than quality ice cream. Theirs is a company with social consciousness, started by two young idealists who have managed to keep their integrity in spite of success. I couldn’t help but to feel impressed by the entire operation. Frozen dairy with a conscience. The larger question, I suppose, is why success so frequently leads to a loss of concern for others. People possess differing levels of empathy, just as animals do, but it appears so starkly in the case of those who prefer their profit at the expense of others, sometimes even the entire remainder of the world. In a universe of one, no one is rich. And seeing a successful company that has managed to pull off relative equity in the world of business has proven that it is possible. Too many idealists let go too soon. Perhaps it is the rarified air at higher elevation, or perhaps I’m being brushed with the wings of angels at this altitude closer to the celestial sphere, but this giddiness that I’m feeling is likely born of bonhomie. There is no necessary correlation between success and lack of concern for others. I am reminded of this as I walk to work in far away Manhattan. The sidewalks, even in posh business areas, host ambiguous stains and crushed cockroaches. Even the wealthy must step out of their limos sometimes. When they do, they will plant their feet on the same dirty sidewalks as the rest of us do. Their elevators may lift them to pristine heights, but the bottoms of their shoes are just as full of the remains of everyday lives as are mine. From now on, however, when I see Ben and Jerry wrappers among the detritus on the streets, I will be smiling, thinking about the aftertaste. While on a drive through New England, we were discussing Islam with our daughter. Now I’m no expert on Islam, but I have covered it in a few classes. It has had a presence in America for a couple of centuries at least, probably first arriving with slaves from Africa. As we drove into Springfield, Massachusetts, I saw four slender towers rising into the sky off the highway and said, “Look, it’s a mosque,” supposing the towers to be minarets. When we drew closer, it was clear that these were really just the decorated finials of a quite secular bridge. Embarrassed at my mistake, my family was kind enough to console me with the suggestion that the four towers from that angle did look like the accoutrements of a mosque. (Earlier in the day I had seen my first Sikh temple in Connecticut, so the mistake might be at least slightly justified.) My wife mentioned how misidentified symbolism could be confusing. This spurred me to consider how symbolism frequently becomes a stand-in for reality. I’ve been reading about witches lately. Like many legendary fears, witches can be interpreted in many ways. They have their origins in the belief that nature may be manipulated by will over a distance and had been feared for the effectiveness of their powerful spells. After the tragic witch-hunts of the Middle Ages ran their horrible course, witches came to be seen as the result of overactive imaginations and rampant superstition. The modern Pagan movement has revitalized the witch in a somewhat safer environment, and has applied various symbols to it. Thor’s hammer, the ankh, and the pentacle are considered the symbols of modern witches by various covens and practitioners. 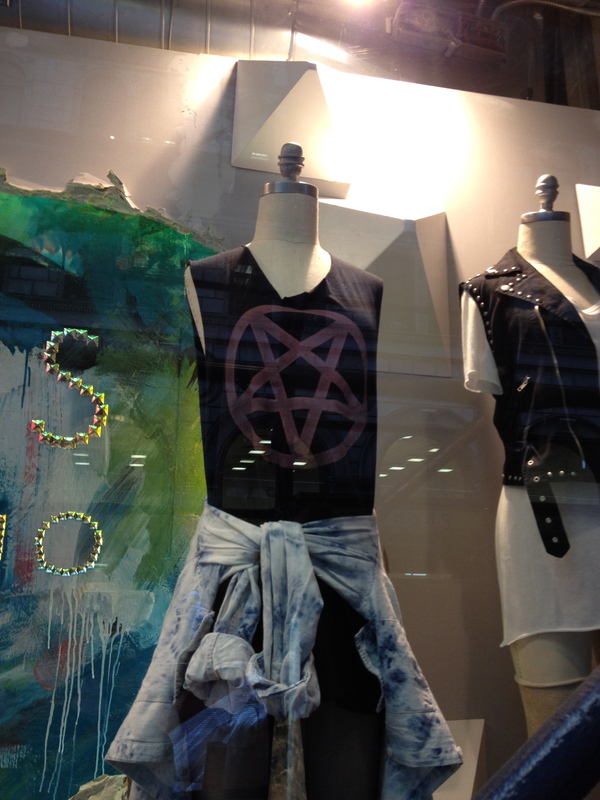 While passing by a department store on East 43rd Street, I noticed apparel decorated with pentacles—the symbolism adopted by some witches. This reminded me of a fracas that erupted some years back when a fashion designer incorporated the ornate letters of the Arabic script into the design of a sleek dress that left less to the imagination than a traditional burka. The designer expressed surprise when Muslims objected to words from the Quran being used to decorate immodestly covered women’s bodies. In both these scenarios symbolism has demonstrated its power for being what philosophers call the Ding an sich, the thing itself. Symbols are often that way, bridging as they do the worlds of religious thought and secular existence. I wonder how much we as a society would gain from letting bridges be symbols that participate in the reality they represent. 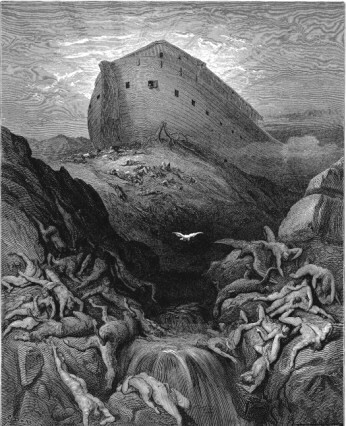 With the drought deepening over about half the United States, it is with not inconsiderable irony that I am reading the story of Noah’s flood. I have been tweeting the Bible for some months now and am just reaching the end of the fascinating account of the deluge. The difference in the case of the drought is obvious, but similar. Having spent some time in the Midwest, I came to know how intimately and intensely many of the citizens trust God’s providential care (this is true elsewhere, of course, but I noticed it more in that region). When disasters come, however, just like an animist would suggest, answers will be sought in the divine world. “While the earth remaineth, seedtime and harvest, and cold and heat, and summer and winter, and day and night shall not cease.” Genesis 8.22 rounds out God’s plan for the perpetuity of nature’s cycles, stating in just the previous verse that he knows people to be wicked and will never punish them for it again, as he did in the flood. Such biblical assurances, however, do little to allay fears when crops are dying in the field. The problem in looking for answers in nature is their ambiguity. Just consider the record number of church picnics that haven’t been rained out this year—the number of prayers I’ve heard for the staying of rain for human convenience is surely a reflection of how intimate divine interaction with the workings of nature is supposed to be. One of the benefits of science has been its ability to straighten out all the cards in the deck, tapping them on the table-top and squeezing them into line. How would God weigh prayers for no rain so that an outdoor wedding of a devout couple could take place versus the prayers of a backslidden farmer for much needed precipitation (without hail)? Are decisions made by majority request? Wouldn’t that be excessively dangerous, given humanity’s track record of deciding what is good for itself? The drought is a serious concern, and I do not mean to suggest otherwise or make light of the situation. What concerns me is the human tendency to look for a divine bailout. Many politicians of certain persuasion (usually the greenback kind) tell us that the climate is just fine. Our greenhouse gasses are not unduly affecting it. Now that a drought is upon us—and even a child can understand that all weather is related—the focus shifts to God. This dancing around the elephant in the room is tiring and dizzying. We can spend billions of dollars making bombers that are almost invisible to radar and so oddly shaped that they get reported as UFOs and yet we can’t get politicians to consider our impact on the very skies they fly in on their bombing missions. The atmosphere is larger than us all and it is warming up. And when we bake ourselves out of existence isn’t it a comforting thought that seedtime and harvest will continue, at least until our sun burns out? Staring out over 42nd Street is the massive triumvirate of Mercury, Minerva, and Hercules. Once the largest group sculpture in the world, the famous facade of Grand Central Terminal is photographed daily, and the number of tourists thronging the concourse make it perhaps the sixth most visited tourist destination in the world. While visitors’ shutters clatter away, photographing the statuary and starred ceiling, I wonder how many stop to consider the religious nature of much of this New York City icon. Mercury, of legendary speed, seems an appropriate mascot for a transportation hub. Along with the remainder of the Greco-Roman gods, however, he has been pigeon-holed as “mythology” and is considered a quaint, if picturesque, archaism. How easily we forget that the religions of the classical world were serious attempts to make sense of their universe. Mercury was borrowed from Hermes, a god who had the task of being a psychopomp—a guide to the underworld. (Somehow very appropriate for the immense subterranean world of Grand Central.) In our monotheistic supersessionism, we recast other faiths as myths, forgetting their gravity. Over on the east side the terminal passageway leads through the Graybar Building onto Lexington Avenue. 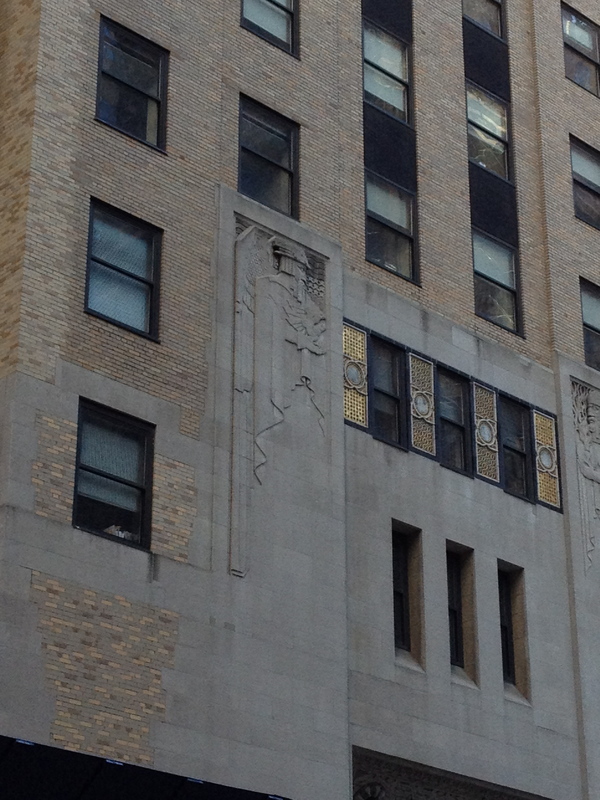 The external friezes are of art deco vintage and show what appear to be angels flanking two of the entrances. My limited architectural knowledge prevents me from finding an actual description of what the figures represent, but it is safe to say the wings upon the back generally qualify a character as somewhat more than human. Graybar eventually became Western Electric and the original company is on the Fortune 500 list (again, I tread in unfamiliar and somewhat scary territory here). Angels watching over the common person? If so, perhaps we need to seek an upgrade. William Henry Vanderbilt, president of Central Railroad, once famously declared, “the public be damned,” in a moment of unexpected candor, showing where the common person stands in the Weltanschauung of the wealthy. 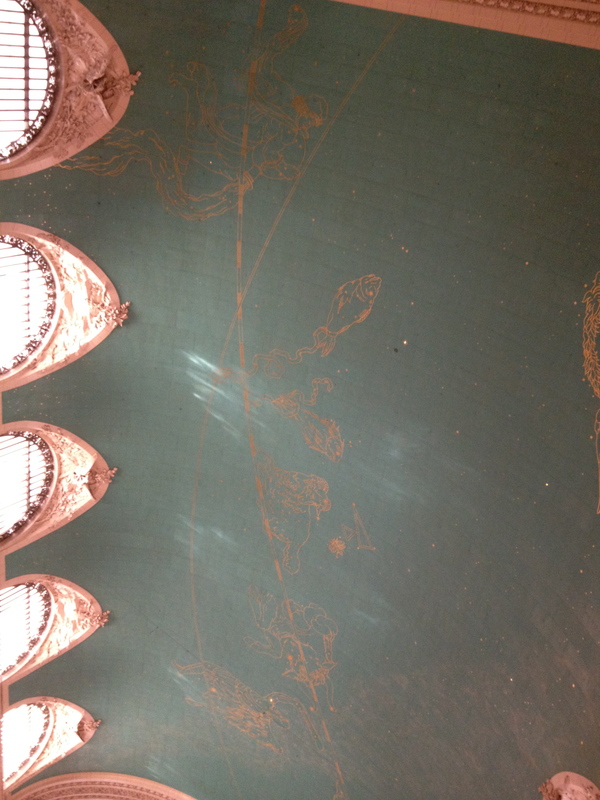 Back inside Grand Central, the famous celestial ceiling always draws considerable attention. Those who know the stars have noted that there is a backwards nature to the array—it does not match any actual outdoor sky. Explanations vary, but it is said to be a “God’s eye-view” of the stars. As we stand below, staring up, we gain a divine view on the celestial sphere. 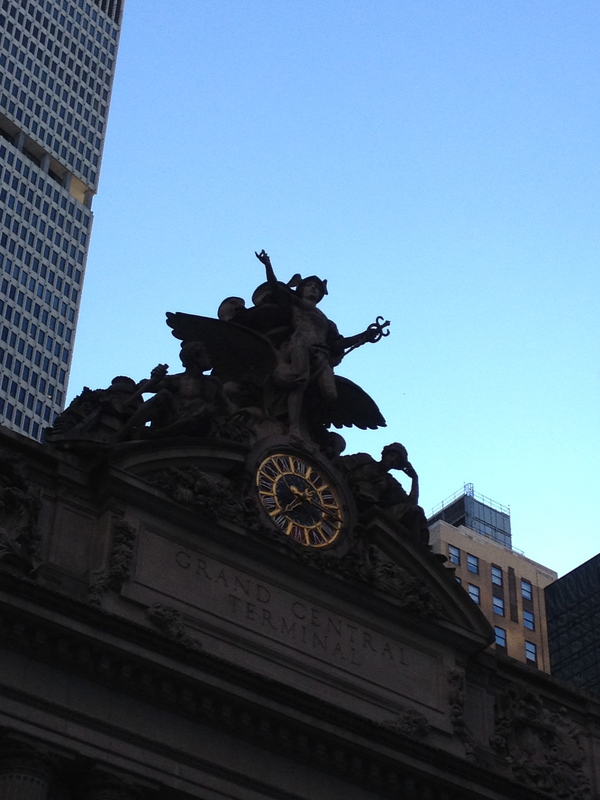 Many thousands of people pass through Grand Central every day. Few, I suspect, stop to consider its role as a monument to the influence religion has in the secular world. Certainly there was no religious motivation behind getting the working public to the city on time. We are the chattels of the wealthy, showing up to our jobs on time. As usual, we are unaware of the power of that which tends to carry on, unobserved. The mythologies of different peoples blend here, but perhaps the greatest myth of all is that the wealth from the gods will trickle down to the average human passing through this sacred edifice. At the risk of sounding extremely uncool (one that I take rather frequently, I fear), I would point out that exactly the opposite is the case. Zombies are rooted in superstition and myth, i.e., religion. The entire idea that a person can be made to rise from the dead—originally to be made a slave—comes from that heady blend of Christianity and African religion that developed as part of slave culture. Slavers were notorious in not wanting slaves to accept Christianity because that might make slaves think that they were equal with their owners. By suppressing Christianity among slaves, the African religions in which many were raised came to blend with the Christianity that they’d garnered. One of the bi-products was the zombie. The zombie partakes of the Christian concept of resurrection, but in a twisted way. 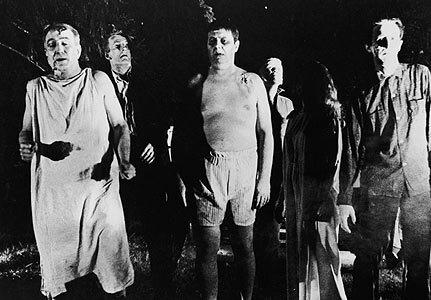 Once the new vision of the zombie presented by George Romero took off, yes, they did move into the realm of science fiction, often the forerunner of science. A very serious issue underlies the zombie myth—the very religious concern about death. While not all religions comfort with an afterlife, they all in some way deal with ultimate issues. The end of life is about as ultimate, from our limited experience, as they come. Science loudly and repeatedly insists that death is the final frontier. We don’t cross back this way again, according to the available evidence. Scientists do not study ghosts or souls, and are very cagey about near-death experiences. The zombie, who is now threatening the careers of young scientists, is a most religious monster. Everything about the zombie points to its origin as a religious trope. Voytek and Verstynen wanted to interest people in science by taking a comic look at zombie brains. The problem is that zombie brains are brains on religion, not science. The fact that prominent scientists occasionally take time from their busy schedules to fire off a broadside against religion and religious believers freely bare their fangs at science shows that we need some efforts at reconciliation. I am reminded of schoolyard bullies when specialists in either realm make claims of exclusivity. Religion and science are both here to stay, and they’d better learn to get along. 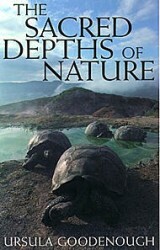 I just finished reading the remarkable little book The Sacred Depths of Nature by biologist Ursula Goodenough. While declaring herself a non-theist, Goodenough, the child of a Methodist minister, preserves a profound respect for the sacred in a concept she calls “religious naturalism.” Her brief book, which a colleague compared to a daily devotional, contains more good sense than all the enraged professionals bellowing at each other from either side of an unbreechable gulf. Uncompromising in her science, Goodenough is not suspicious of the human religious impulse, but embraces it in the expressions of nature. It is an approach I found liberating and amazingly conciliatory. It lacks the territoriality of Stephen Jay Gould’s Non-Overlapping Magisteria (NOMA) and preserves the integrity of the human person in all its complexity. The day I finished the book the headlines of the paper announced the premature death of Sally Ride, another woman who moved science in the right direction. Ride’s sister is a Presbyterian minister, while Ride herself was a physicist as well as the first American woman in space. Aboard the space shuttle Challenger, she made history also as the youngest American in space. Typical of the imperialist national attitude that unfortunately still reigns supreme, space had been tacitly declared a man’s world. 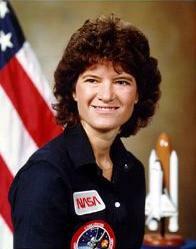 Sally Ride shattered that glass ceiling at 17,500 miles per hour. Even so, change seems to have decelerated once again to far below sub-orbital speed. Religion is partly to blame. A deep component in our culture, religions in the western world have traditionally asserted male superiority. Even those who claim God to be sexless can’t really conceive of a big person without some gender. The day after her death and the headlines had shifted from mourning to astonishment that she was gay. The loss of Sally Ride is a loss to science, for she was in the heaven formerly occupied by God, showing women the way. I am, however, comforted by the efforts of Ursula Goodenough to keep the dialogue open. Too often, it seems, that conflict is the cost of disagreement. One of the observations of astronauts is that long periods confined with the same small coterie of people lead to inevitable disagreements. The question facing us all—for our planet is not so large after all—is how we will choose to deal with differing worldviews. It was declared that science would eventually bury religion, once reason had taken hold and superstition had run its course. Although the grave was dug, it has never been filled. Maybe we should all read the sensible approach of Goodenough and just be glad that we’ve all had a chance to be here at all. And remember Sally Ride as a fearless explorer, a hero rather than a spectacle.